A microphone is an acoustic-to-electric transducer or sensor that converts sound into an electrical signal. 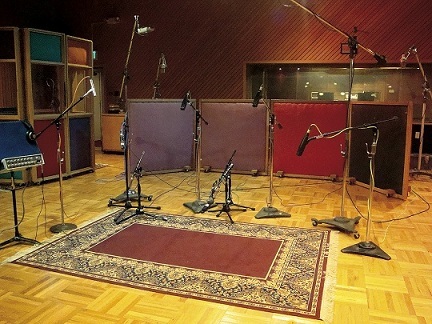 Microphones are used in many applications such as telephones, tape recorders, karaoke systems, hearing aids, motion picture production, live and recorded audio engineering, FRS radios, megaphones, in radio and television broadcasting and in computers for recording voice, speech recognition, VoIP, and for non-acoustic purposes such as ultrasonic checking or knock sensors. Most microphones today use electromagnetic induction (dynamic microphone), capacitance change (condenser microphone), piezoelectric generation, or light modulation to produce an electrical voltage signal from mechanical vibration. Both Thomas Alva Edison and Emile Berliner filed patent applications for the carbon microphone, in March and June 1877 respectively. After a long legal battle, Edison emerged the victor, and the Berliner patent was ruled invalid by both American and British courts. The sensitive transducer element of a microphone is called its element or capsule. A complete microphone also includes a housing, some means of bringing the signal from the element to other equipment, and often an electronic circuit to adapt the output of the capsule to the equipment being driven. A wireless microphone contains a radio transmitter. Microphones are referred to by their transducer principle, such as condenser, dynamic, etc., and by their directional characteristics. Sometimes other characteristics such as diaphragm size, intended use or orientation of the principal sound input to the principal axis (end- or side-address) of the microphone are used to describe the microphone. Early microphones did not produce intelligible speech, until Alexander Graham Bell made improvements including a variable resistance microphone/transmitter. Bell's liquid transmitter consisted of a metal cup filled with water with a small amount of sulfuric acid added. A sound wave caused the diaphragm to move, forcing a needle to move up and down in the water. The electrical resistance between the wire and the cup was then inversely proportional to the size of the water meniscus around the submerged needle. Elisha Gray filed a caveat for a version using a brass rod instead of the needle. Other minor variations and improvements were made to the liquid microphone by Majoranna, Chambers, Vanni, Sykes, and Elisha Gray, and one version was patented by Reginald Fessenden in 1903. These were the first working microphones, but they were not practical for commercial application. The famous first phone conversation between Bell and Watson took place using a liquid microphone. A microphone's directionality or polar pattern indicates how sensitive it is to sounds arriving at different angles about its central axis. The polar patterns illustrated above represent the locus of points that produce the same signal level output in the microphone if a given sound pressure level (SPL) is generated from that point. How the physical body of the microphone is oriented relative to the diagrams depends on the microphone design. For large-membrane microphones the upward direction in the polar diagram is usually perpendicular to the microphone body, commonly known as "side fire" or "side address". For small diaphragm microphones such as the Shure it usually extends from the axis of the microphone commonly known as "end fire" or "top/end address". Some microphone designs combine several principles in creating the desired polar pattern. Foundational text courtest of Wikipedia. Do you have content, to add, about Microphones or associated topics? Please feel free to Share it, here!